Join Rio Grande Community Farm and Mountain Dojo for a Spring celebration at the big red barn! Come on down to the farm to pick up some plants at our annual plant sale. Stick around to enjoy live music by some legendary local bands, food from the foodiest food trucks in the state, an easter egg hunt, steer roping, and games for kids of all ages—toddlers, teens, and retirees all welcome to play. Price: $15 donation requested. No one turned away. 2:00 PM in the barn yard. The Mountain Dojo’s mission is to provide an inclusive creative space for individuals with and without disabilities to create and connect through art and movement. They aim to create sustainable systems to continue to provide free classes so everyone has the opportunity to learn new skills and take classes for fun. 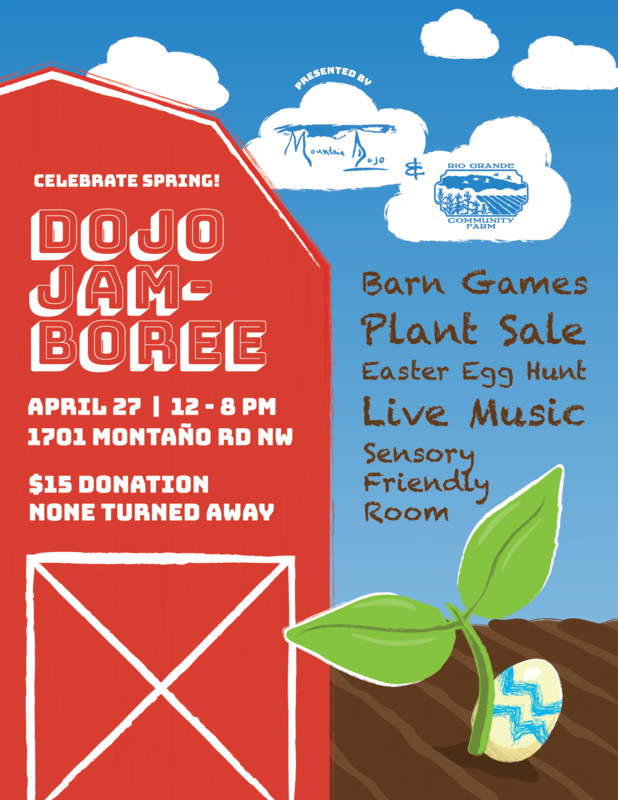 Rio Grande Community Farm is hosting the event with The Mountain Dojo to help raise funds to support their cause. Come out and support to a great cause—it should be loads of fun to boot.